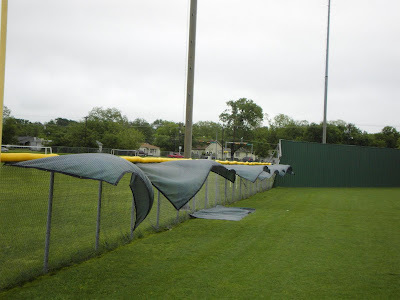 Saturday night's storm left a mess all over Terrell. Here are a few pictures from the Tigers ball field. Most of the damage around town looks like wind damage. Hopefully, we will find out this week how the UIL will sort out the baseball and softball playoffs. All games have been delayed to at least May 11th because of H1N1. The boys also have one more district game that needs to be squeezed in to at least be able to recognize the seniors in this historic season. As soon as something is released I will update the calendar at the bottom of the page. 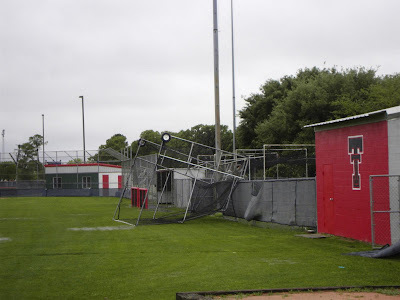 The batting cage is flipped over the fence and upside down. 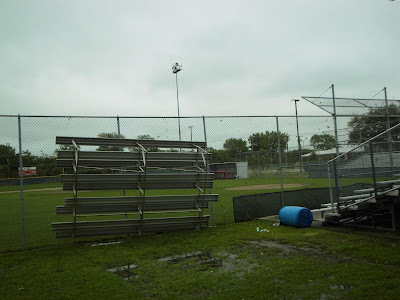 A section of bleachers pushed up against the fence. Click on any picture to make larger. If you have reached this page from a search engine, click on the main picture at the top to reach the main page.